We're wild about Long Beach State hockey--check out this story about their game against U of W.
In the midst of California’s state budget negotiations, the legislature must separately decide how to spend the state’s cap-and-trade revenue, be it on public transit, high-speed rail, affordable housing near transit, or other emissions-reducing programs. Click the image for a larger version. Three different proposals for slicing this new pie come from Governor Jerry Brown, the Senate, and the Assembly. In the next week, legislators must find a way to meld these three plans, or just choose one. To help explain the differences between the three approaches, we created the above chart, with more explanation below. This relatively new pot of money, collected under the authority of the California Global Warming Solutions Act of 2006, or A.B. 32, by law must be spent on programs and projects that help reduce greenhouse gas (GHG) emissions throughout the state by 2020. The administration estimates that the cap-and-trade system will raise about $870 million in 2015, and various estimates assume it could grow to several billion dollars each year between 2015 and 2020. In all three of the plans, there is no set-aside for active transportation. Bicycle and pedestrian planning would be included within a larger group of as-yet-undefined projects and programs, called a “Sustainable Communities” program. Programs in this group would compete for funds based on how well they achieve GHG emission reductions. In each plan, what is included under Sustainable Communities and how much money is allocated to that pot of funds differs. First presented in February, Brown’s proposed plan focuses on funding high-speed rail. It would allocate $250 million to the bullet train in the first year and include a provision to spend a third of all cap-and-trade revenue on high-speed rail in future years. The administration’s plan would also assign specific amounts to various other programs and projects that aim to reduce GHG emissions. This plan covers the first two years of cap-and-trade funding, dividing up $870 million in the first year but leaving the next year’s revenues undefined, except for the portion for HSR. The governor’s plan would allocate $100 million in 2014-15 and 2015-16 to the Sustainable Communities category, under which bike and pedestrian planning would fall. Transit, transit oriented development, and other programs that aim to reduce vehicle miles traveled would also compete for these funds. The plan delegates authority for deciding these allocations to the Strategic Growth Council, which is composed of representatives from six state agencies plus one member of the public and charged with coordinating state programs related to sustainable communities and the environment. 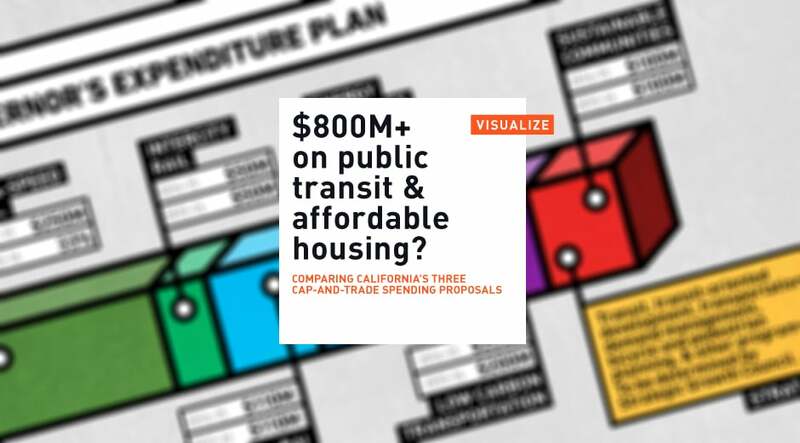 Based on a framework presented by Senate President Darrell Steinberg (D-Sacramento), this proposal emphasizes affordable housing near transit as a strategy to reduce driving. It would also create a separate category for transit, providing it a dedicated, stable source of funds; it would also allot less money for high-speed rail. The Senate plan would also divvy up the cap-and-trade revenue by percentage, rather than set amounts, thus creating a long-term spending formula. The chart above shows the amounts each category would receive in 2015, assuming a total revenue of $870 million, to more easily compare it with the other plans. Instead of allocating the funds to specific programs, the Assembly plan divides it into two pots: the state pot and the local pot (labeled “Sustainable Communities”). Within each, projects would compete for funding by proving they reduce GHG emissions. This was an attempt to level the playing field between state and local projects. This is different from the Governor’s plan, under which state projects like high-speed and intercity rail would be allocated funding without having to compete, while local projects would have to compete with one another. Although the Assembly’s approach would require projects to document how well they would reduce GHG reductions, it would force very different types of projects (transit, housing, active transportation) to compete against each other. In addition, the Assembly proposes allowing the state to borrow up to $40 billion for high-speed rail, though HSR would still have to compete with other state projects for cap-and-trade funds. The joint Assembly and Senate Budget Conference Committee is meeting next week to hammer out an agreement on the state budget, which by law must be signed by the governor by midnight on June 15. Article written by Melanie Curry; article courtesy of Streetsblog LA, with its editor Damien Newton credited below.